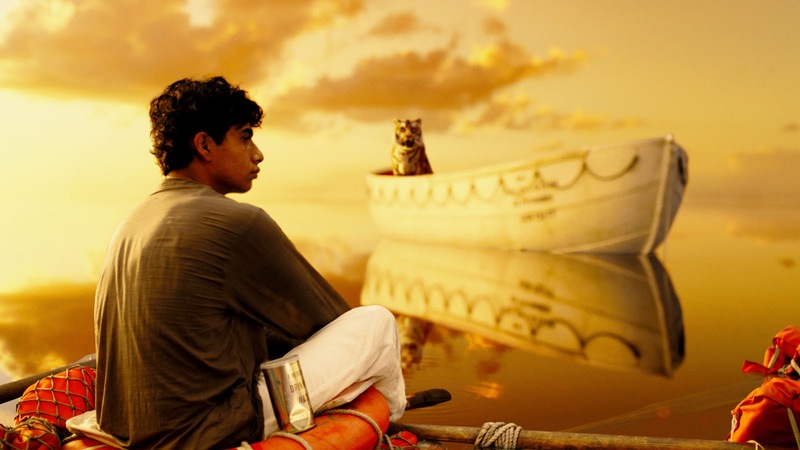 Fruitless Pursuits: Review: Life of Pi. I read Yann Martell’s Life of Pi some ten years ago at the insistence of my well-read girlfriend. It stuck with me then, as director Ang Lee’s stunningly beautiful film adaptation sticks with me now. An unlikely story of a boy who winds up on a lifeboat with a tiger, there is far more here to unravel than the premise suggests. If Pi stretches belief, it’s to make you believe. Pi has a point. A sharp point that is driven home at the end of an expertly told, thought-provoking and life-affirming story. To find out why I love this movie... join me after the jump! The curiously named tiger, Richard Parker, may dominate the film’s centre, but this story really takes place over a number of decades. The middle-aged, post-ordeal Pi is tasked to recount his tale to a writer who has been promised that what transpired will “make him believe in God”. Pi takes his time, weaving in enough details of his childhood and family life to allow us to understand what has shaped his worldview, and greater emphasize with his character once things begin to go pear-shaped. It is while transporting the family zoo on a cargo ship that disaster strikes and Pi finds himself adrift on a lifeboat with a handful of desperate animals, the most daunting of which is a full-size Bengal tiger. Simply surviving will test his body, mind and faith. It’s impossible to discuss Life of Pi without discussing spirituality but don’t let that dissuade you. If you’re a religious person then don’t expect Pi to enthusiastically echo your beliefs (Pi himself subscribes to at least three different religions), and if you’re not religious, like myself, then relax in the knowledge that the film is in no way preachy and certainly doesn’t offer up any easy answers. In Life of Pi God is a puzzle and the story is ultimately open to interpretation. I won’t say that it fulfilled its promise of making me believe in God, but it certainly puts forward a compelling argument to help us understand the belief of others. By the end, when all the threads tie together, Pi is extremely satisfying, leaving the viewer with plenty to chew on. As to whether or not Ang Lee’s version is completely faithful to the book, I couldn’t tell you. It’s been too long since I’ve read it to nitpick over details, but I’ll certainly say that it felt faithful. My memory was constantly stirred and there is no doubt that Lee has successfully captured its message and spirit. The biggest addition from page to screen is, of course, the breathtaking visuals. Lee alternates the harsh reality of a bleak and dangerous ocean with whimsical, haunting, dreamlike images that almost resemble paintings. Inky sharks circle one minute, and magical phosphorescent creatures the next. But the biggest achievement is the tiger, Richard Parker, who is 99% percent computer animated but always fully present and believable. His performance is well studied and always perfect, as he too struggles through an ordeal that puts him to the test. Many times I wondered if what I was looking at was real, only to have the tiger react to a situation in such a flawlessly apt way that I knew some wizardry must be involved. The script, too, is exceptionally well crafted, effortlessly leaping through time, fleshing out details through flashbacks, flash forwards, and narration. No moment is wasted, nor does anything feel out of place. A good deal of the credit should go to Pi performer and newcomer Suraj Sharma who missed out on an Oscar nomination but does an admirable job. He is instantly likeable and sells so much of the story in spite of a co-star who has no words and didn’t actually exist on set. I experienced Life of Pi a couple of days ago now, and I’ve mulled over and stalled on this review because I felt that there just wasn’t a lot to criticise. It’s not instantly on my list of all time favourites by any means, but I genuinely and thoroughly enjoyed every moment of it. I feel like it’s a very complete film that is confident on all fronts, and much of the joy to be had is to just submit to it and let it wash over you. It’s a journey film and I was absorbed in the journey. If you don’t know much about the story then the fun is in discovering it, and if you’re a fan of it already then be rest assured that Ang Lee does it justice. One final point of note. Due to a change in schedule, I saw the film in 2D but it is clearly intended to be best viewed in 3D, and you will have no trouble identifying the few scattered moments that are clearly designed to take advantage of that. I’m of that rare breed that enjoys 3D films, but chances are that a lot of us, especially on DVD and Blu-ray, will be watching this in 2D and those moments are likely to stick out and possibly even take you out of what is otherwise a very immersive film. Apart from the obvious “things flung towards the camera” shots, there’s a trippy dream sequence that is inventive and gorgeous but feels like a 3D showreel. It’s a minor complaint, but it’s there. I urge you to shed your cynicism and take a plunge into Pi. It has a lot to offer if you let it. I saw this movie and interpret Richard Parker to represent God. Richard Parker did not look back to say Goodbye, because God never says goodbye, God is always with us. I love it!